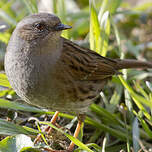 The dunnock (Hedge Sparrow) is a robin-sized bird, but its bill is finer and the the bird is more slender. 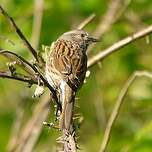 Its brown streaked back is reminiscent of the house sparrow with which it sometimes confused because of its coloration and familiarity. 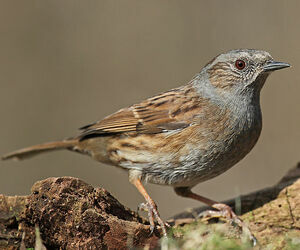 The dunnock has a blue-grey head with the parotic area and crown nuanced with greyish-brown. The breast is similarly coloured. The legs are a reddish brown and the tail has no white markings. The primary covers are marked with fine pale spots which may constitute a sort of narrow wing band. 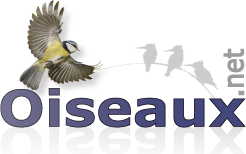 The whole aspect of the bird is drab and uniformly coloured, except for the lower breast and the belly which have white spots. Juveniles have marked striped back. Birds from Northwest Scotland and Ireland (hebridium race) are darker, especially the top of the breast. 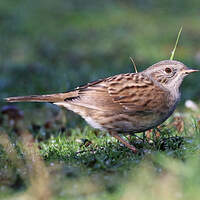 Those sedentary in the British Isles (occidentalis race) show a colouring intermediate between that of the hebridium race and the western European (modularis) race. 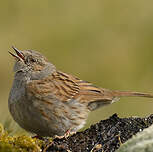 The dunnock's repertoire is quite wide. The in-flight contact call, usually heard at dawn or at dusk, is a tinting or trembling and very fine "teeheeheehee". The alarm call (sometimes used also for contact) is a loud and sharp "teeeh". 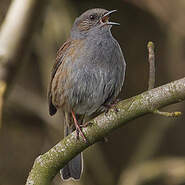 The song, usually emitted from the top of a tree, is a sharpish phrase, quite ringing, lasting about two seconds. It is interwoven without given motif and a rather even tone. 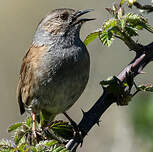 This little melody reminds one of that of the Wren but shorter and more bursting. 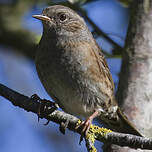 In Northern Europe, the dunnock is found in coniferous woodland, in mixed woodland with clearings and thick undergrowth. It is also found in young Norway spruce plantations. In temperate Europe, it occurs in parks, gardens, graveyards, hedges and dense scrub. 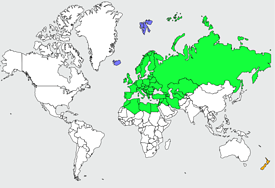 Its range encompasses all of Europe (save the extreme north and south) and part of Asia minor. Populations in the south and west are sedentary while northern population winter in Central Europe or the Mediterranean coast. 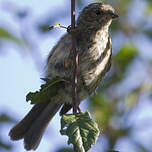 This species occurs throughout the UK and has been introduced in New-Zealand where it is widespread. 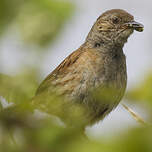 The dunnock is very visible and at the top of a tree or shrub when singing, but otherwise lives hidden and can be hard to spot as it will disappear in the undergrowth at the first sign of danger in a quick bounding flight. 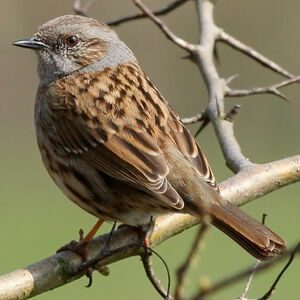 In regions where it is migratory, the dunnock arrives in March-April and leaves between September and December. 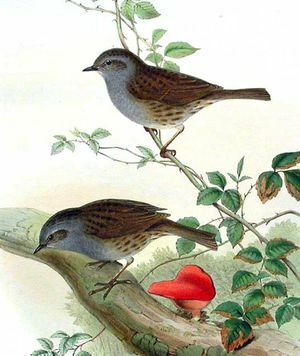 The flight is reminiscent of that of a warbler, but slower with frequent flapping of one or both wings. Its diet varies seasonally. 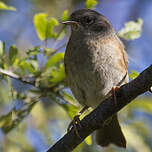 In summer it feeds mainly on insects in low vegetation or even the ground. 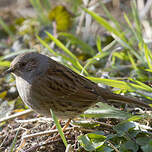 The dunnock does not catch its prey in flight. 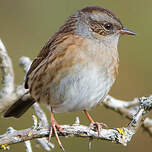 Its slender bill is a testimony to the dunnock's taste for insects, albeit only in summer. In winter, when insects are few and far between, it feeds mostly on bays and seeds. 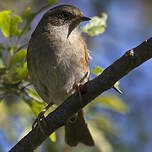 The nest is usually constructed less than 1.5 meters from the ground in a bush or young tree, often a conifer). It is made of dry moss and grass, with some twigs at the base. The inside is laid with horse hair, moss, fine grass and, rarely, feather. The female sits on 3 to 6 turquoise eggs during 13 to 14 days. The eggs can be quite colourful as the nest is usually in a dark spot and egg camouflage becomes lees critical than for birds that nest in the open. The chicks stay in the nest for 10 to 14 days and are mostly fed insect. They fledge before their plumage is complete. An adult pair generally successfully manages two broods per season. Ménage à trois and extra-marital mating are frequent. 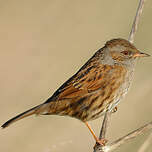 The dunnock is amber-listed in the UK.